The recent Joint Center report, America's Rental Housing: Evolving Markets and Needs, reiterates the extent of severe cost burdens faced by renters, especially those with low incomes. 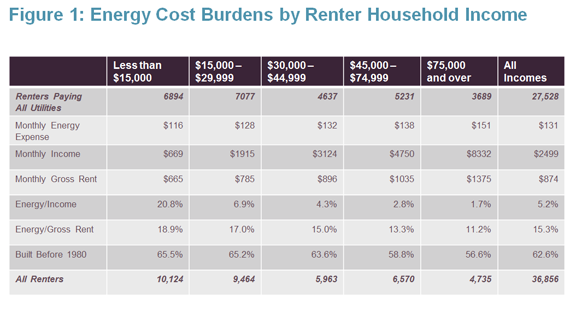 A research brief I prepared in connection with the report documents the large share of the cost of rental housing attributable to the cost of energy, particularly for low-income renters. Among renters who pay for all utilities, payments for energy represented a median of 13 percent of gross rents (rent plus utilities). 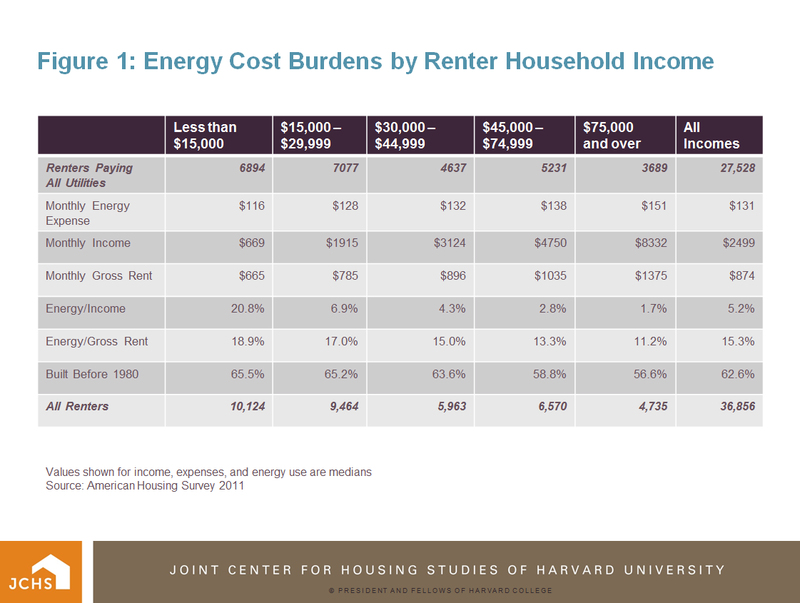 Energy expenses are nearly as high for low-income renters as for high-income renters, and consequently account for larger share of gross rents and of incomes for those with low incomes. Median monthly energy expense for those paying all utilities in 2011 was $116 for those with annual incomes of less than $15,000, compared to $151 for renter households with incomes over $75,000 (Figure 1). This partly reflects the fact that energy use is a necessity, but it is also due to lower energy efficiency in the housing occupied by low-income renters. About a quarter of renters have some or all of their utilities included in their rent. For those renters, the cost of energy may not be visible, but it represents a major component of the operating cost for their housing, and tenants ultimately pay that cost with their rents. Even where renters pay directly for energy used within their individual units, energy costs for common areas and facilities are a substantial component of the operating cost for the property and are reflected in rents. Among all multifamily rental properties, payments for energy by property owners represent about 9 percent of rent receipts. Rental housing generally uses more energy, relative to living area, than owner-occupied housing. Newer homes are generally more energy-efficient than older ones. Energy use per square foot is particularly high among the nearly 7 million multifamily rentals built before 1960 (Figure 2). There has been substantial investment in older owner-occupied housing over the years to improve efficiency, but not as much for multifamily rentals. 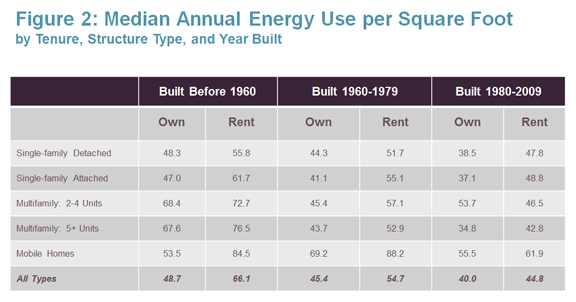 Older single-family rentals, many of which were owner-occupied in the past, use less energy per square foot than older multifamily rentals, but still use more energy per square foot than owner-occupied single-family homes. For the majority of renters who directly pay for the energy used in their homes, the amount used reflects the quality of insulation in the structures and on the efficiency of the equipment. Efficiency depends on investments made by the owners of the properties, who may not be motivated to invest in efficiency improvements if they don't pay the bills for usage. This separation between investment decisions and usage costs has been described as a "split incentive" situation and is a central issue in renters' energy costs. Another type of split incentive arises when the owner pays the bills but the tenant controls the temperature and the lights. My research brief discusses several policy options for overcoming the split incentive problem where the tenants pay for utilities. These include regulations mandating energy efficiency and subsidies for investments in efficiency. The most promising approach, however, may be to make energy efficiency more transparent, so that renters can easily anticipate energy cost in choosing where to live. If that makes occupancy rates and rental income more dependent on efficiency, property owners would have a greater incentive to invest in efficiency. Several localities have recently established requirements for benchmarking and disclosing energy expenses in rental properties, providing a test of whether that will lead to an easing of renters' energy cost burdens. Split incentive problems are not the only source of energy inefficiency and excessive energy cost burdens in rental housing. The research reported in the brief, and earlier research cited there, indicates that in rental properties with utilities included in the rent, where the owner has a greater incentive to invest in efficiency, insulation quality and equipment efficiency is not consistently better than in rentals where the tenant pays for utilities, once variables such as regional climate and age of the structure are accounted for. Whether or not utilities are included in the rent, rental housing does not generally include efficiency characteristics comparable to owner-occupied housing. Other factors are evidently also involved. The paper suggests, for example, that the financial resources of rental property owners may be a constraint. Moreover, government programs such as the DOE Weatherization Assistance Program are designed in such a way that assistance goes primarily to owner-occupied housing, even though the low-income households that are the intended beneficiaries are mostly renters.